I LOVE visitors. I LOVE playing tour guide. I LOVE showing off how awesome portland is -which isn't even really a task, the offerings of Portland are not duplicated anywhere else. This past weekend my husband had four friends from the east coast (Tennessee), and the Midwest (Detroit, Michigan, and Chicago) drive an RV cross-country on a two-week bro-escapade of all sorts. 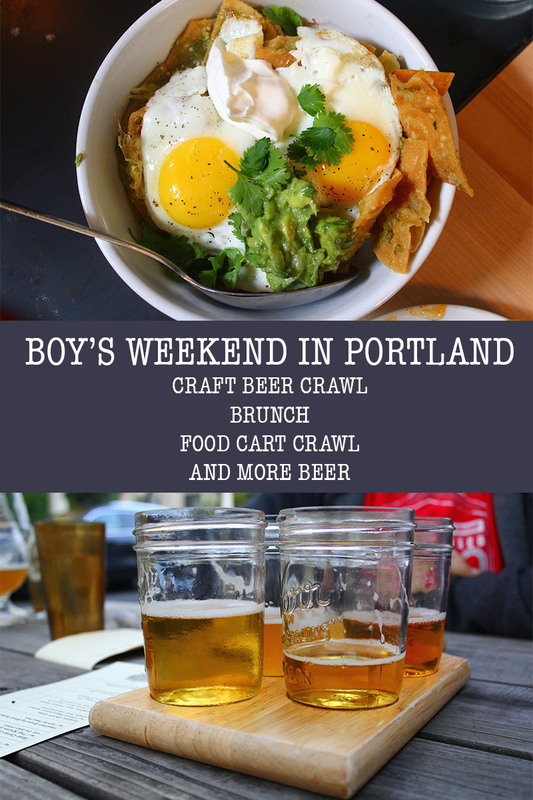 When Bro's Weekend finally approached, I nudged, and nudged on my husband to zero-in on what events the boys wanted to do while in Portland. An RV full of guys, plus my husband, would only mean there were no definite plans to be; just a lot of "go with the flow" -it killed me. Turns out, their two-night stopover in Portland, Oregon would involve lots of beer drinking, eating at some amazing places, guy talks, and of course, donuts! We started the bro-escapade by meeting the crew at one of our favorite beer pubs, Loyal Legion, where everyone was able to select a preferred beer from their huge 90 beer + tap list. After a few rounds of Oregon craft beers we all set off next door to Robo Taco for belly busting baby-sized burritos. We ended the night on an easy note as the boys had a full day ahead of Portland Breweries and eat the following day. After a quick 9a massage for myself, I met up with the boys down at Hopworks brewery, where they were enjoying a little brunch appetizer in the form of a Bloody Mary. The Mary's at Hopworks appeared to have been loaded with everything from the garden and a few pantry staples. After downing a water while the men started on their first of many alcoholic beverages we made our way back down Williams street where a table for six was about to be ready at Tasty n Sons. Over a cup of coffee, while waiting, we poured over the expansive menu and simultaneously started to drool. Shortly after we sat, the boys ordered another round of Bloody Mary's and a few chose beerbacks with jerky in addition to their savory meal in a glass. For our brunch eats we chose to order an assortment of dishes for everyone to try, a true family-style if you will. Here's a photo run down of how we spent our saturday with the rolling RV of friends. polenta + sausage ragu + fried egg! After brunch I went home to nap and the boys went to Ex Novo Brewery in North Portland, and then, made their way downtown to Bailey's Tap room in SW Portland. After my wonderful two hour nap I woke up hungry and offered to play Designated Driver for the rest of their day. I was summoned to pick them up from one of my favorite breweries Base Camp Brewery in SE Portland. After the men finished their beers they we were all ready to enjoy some food cart food, we our made way down towards the Cartopia food cart pod on the corner of 12th and Hawthorne Blvd. We had a mission while here, to order the aforementioned Chicken and Guns, this name was hard wired into our guests' minds as it was brought up by Craig on the hour, every hour. As imagined he went straight towards the cart and ordered some Chicken and Guns' chicken wings and those A M A Z I N G potatoes! two baskets of wings and potatoes from Chicken and Guns did not last us long. Since I've been a long time fan of PBJ's Grilled I have had my order down for years, hardly straying from it except to try a special here and there. So with a crew willing to try new things I ordered the Spicy Thai sandwich and of course had to share this curry, basil, coconut shrimp, pb and j sandwich with the friends, needless to say it was devoured within seconds. After our little pb & j, and chicken and potato appetizer we drove a little further south and found ourselves at Imperial Taproom on SE Division St. while all enjoyed their beers one of the guys ran down to Pok Pok and put our names down for dinner, we had were expecting a long wait, and just as expected a long long long wait was predicted. Imperial Taproom is a wonderful beer bar on the very busy division st. in portland, or. weather you're a novice or expert beer drinker the folks at Imperial can help you find a beer in your favored profile to enjoy. Since we had expected a wait for Pok Pok we ran across the street to Whiskey Soda Lounge and started with a few Thai drinking food appetizers; Ike's famous fish sauce wings, crispy pig ears, roasted nuts, and various drinking vinegar soda's and a round of slushie beers. before too long our table at Pok Pok was ready. once we were all seated we decided to order family style again and picked out a variety of our favorites; papaya salad, khao soi, northern Thai sausage, tiger salad, the spicy boar collar, and a few rounds of sticky rice. I don't know how we were able to stand up after a full day of feeding, and for the boys drinking plus a full day of eating! We all retired after this wonderful meal. Thai Rice ice cream from Fifty Licks! Saint Cupcake - a friday morning stop for Craig and I.
did we hit any of your favorites or have some suggestions we need to add to our next round of out-of-town guests?